The ProSound Alpha 6 brings outstanding image quality, award winning design, unprecedented feature-rich performance, and ease of use to the office market. Building on the ProSound technology strengths, this compact system offers high-end features and technologies in an easy-to-use, affordable and environmentally friendly system. The ProSound Alpha 6’s high power processor allows a number of imaging modes previously seen only in high-end systems. 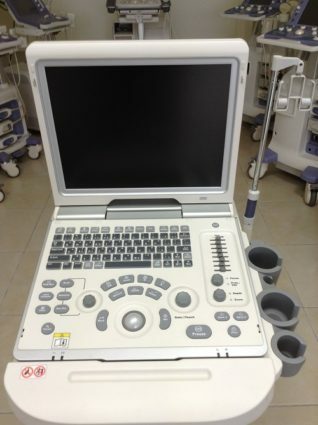 The system supports a full range of probes and software, designed to support better diagnostics and patient care. Additionally, the ProSound Alpha 6 is fully upgradeable and easy-to-use. The lightweight ProSound Alpha 6 has the smallest footprint in its class offering outstanding mobility. With reduced power consumption, the ProSound Alpha 6 is also designed to be economically and environmentally friendly. Winner of the International Forum product design award. Ergonomically designed to help prevent user musculoskeletal injuries. Customizable touch screen and panel switches and multi-function controls. Height adjustable control panel and swivel/tilt LCD monitor. Broadband Harmonics™ technology provides high penetration imaging with the sensitivity and resolution that rivals fundamental imaging. BbH reduces artifacts caused by side lobes and multiple echoes. AIP clearly displays differences in tissues and reduces speckle noise while maintaining the frame rate. SCI reduces artifacts dependent on the beam direction and generates better definition. Instant optimization of the B-mode image brightness. D-eFLOW allows blood flow in tiny vessels to be displayed with higher sensitivity and higher frame rates than conventional blood flow methods. High and low velocity flow can be detected with virtually no blooming. Three M-Mode cursors can be set at any position and angle simultaneously, eliminating the complication of trying to achieve these measurements with conventional M-mode. 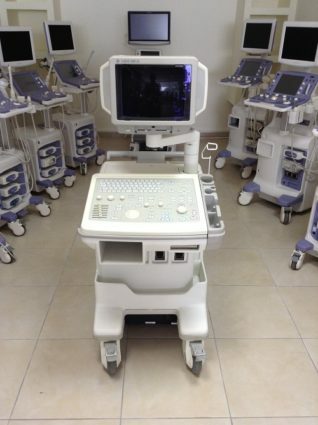 EFV provides a panoramic image of the entire anatomical structure. Low power consumption and made from ecology-conscious materials. The lightest and smallest footprint in its class allowing for excellent portability.